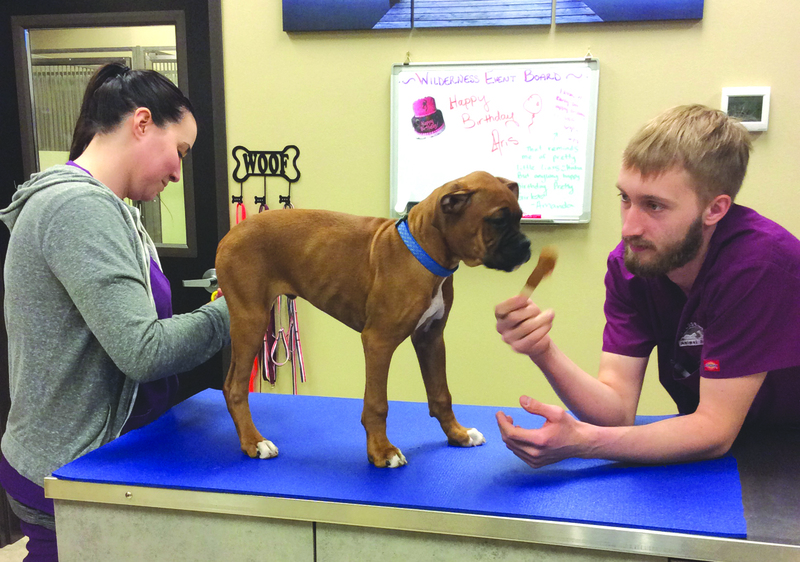 “Ammo” is getting his nails trimmed while enjoying yummy treats with Amber and Connor. Last month I wrote about Feline Friendly certification and that Wilderness Animal Hospital has achieved Gold certification. I’m now very excited to say we aren’t forgetting our dog patients. We are so excited to be part of the Fear FreeSM initiative in veterinary medicine. After attending a couple days of training for Fear FreeSM initiative at a meeting in Florida, my office manager and I returned so impressed with the program, we signed up all our veterinarians and technicians for the training. As each person finishes the training, the change is amazing to see. So I have to be honest before I went to the training I thought, “I’ve been doing this almost 30 years, and we do a pretty good job with difficult patients, many people bring their animals here because of our reputation for being able to handle the more difficult pets.” But I have to tell you, the training has opened my eyes to a completely different way of practicing, interacting with our patients and as every employee finishes the training, they feel the same way. Developed by “America’s Veterinarian,” Dr. Marty Becker, the Fear FreeSM initiative aims to “take the ‘pet’ out of ‘petrified’” and get pets back for veterinary visits by promoting considerate approach and gentle control techniques used in calming environments. Utilization of Fear Free methods and protocols leads to reduction or removal of anxiety triggers, which creates an experience that is rewarding and safer for all involved including pets, their owners, and veterinary healthcare teams. Learn more at www.fearfreepets.com. So what does that mean to you and your pets? The short answer is happier visits for you and your pets. On top of that, there is an added benefit to the employees, we get to have more fun with the pets and their owners. Since becoming a Fear Free certified practitioner, I am constantly carrying around treats of some sort in my pockets. What’s better than a doctor that smells like your favorite treat? My shopping cart is full of cheese in a bottle (dogs and cats love it! ), canned meat, peanut butter and pretzels, all for my patients. We have made changes to our facility and how we manage our patients also. When you come in for a visit, you will notice there is music playing in the exam rooms. The music is specifically made to decrease the stress in our patients. It also is very relaxing for people, too! We have diffusers plugged in that spread pheromones to help calm our patients. The dog pheromone mimics the smell a nursing mommy dogs has and the cat one mimics the feline facial pheromone, aka the “happy kitty smell” mimicking what a cat spreads when rubbing their face on objects.